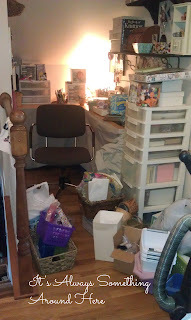 My craft area is in a small hallway at the top of our stair well upstairs. It is a perfect little spot that I am so lucky to have but it needed some tweaking. It had become a dumping ground for all sorts of stuff. I wasn't able to use the area effectively any longer and it was irritating to look at each time I passed it. So tell me I am not the only one that has areas of their home that are a hot mess!!! And here it is now.....ahhhhhh so much better!! I have actually used it several times since cleaning and reorganizing it! Spring cleaning has begun around here. Trying to take it one task at a time and not get overwhelmed by all I want to do this Spring! Girl you did a GREAT job. Keep it up. One spot at a time and before you know it every thing will feel shiney and new. Wow! That is an amazing transformation! So inspiring! You are doing great. Hard to believe it is the same space. 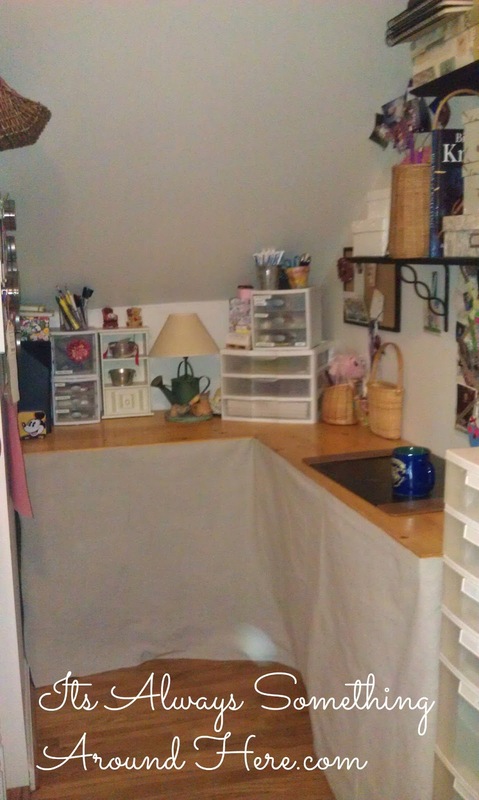 I would love to have that space for my crafts. You are not alone- glad to see others had before pictures LOADED WITH STUFF!